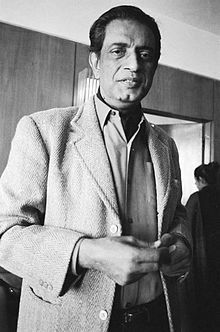 Satyajit Ray (Bengali: [ˈʃɔt̪ːodʒit̪ ˈrai̯] ( listen); 2 Mey 1921 – 23 Aprile 1992) wis an Indie Bengali filmmaker, widely regairdit as ane o the greatest filmmakers o the 20t century. ↑ Tmh (2007). Book Of Knowledge Viii, 5E. Tata McGraw-Hill Education. ISBN 9780070668065. ↑ Robinson, W. Anderson. "Satyajit Ray". Encyclopædia Britannica. ↑ "Iconic filmmaker Satyajit Ray's 94th birth anniversary celebrated". Daily News and Analysis. 2 May 2015.